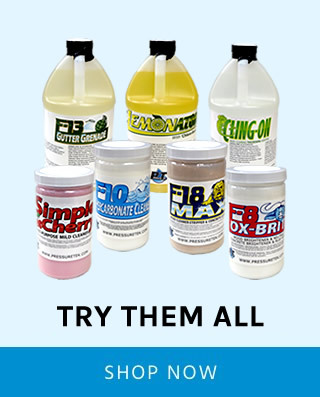 What types of guns does Pressure Tek offer? We offer both high- and low-pressure guns. 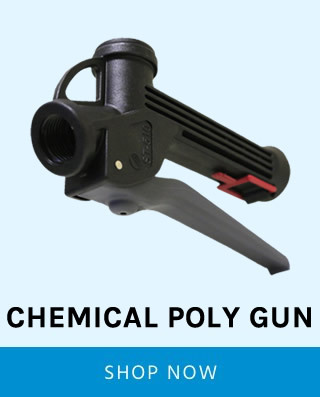 High pressure guns are used mainly on pressure washers, while low-pressure guns are used on direct chemical applicators - also known in the cleaning industry as soft wash systems. 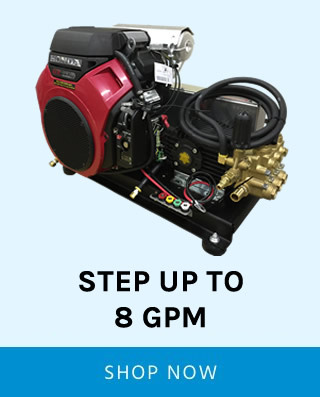 These direct application systems can be anything from pump up sprayers, 12-volt diaphragm pumps, air diaphragm pumps and gas-powered diaphragm pumps. What GPM should I buy? You should buy a gun that at the minimum is rated equal to your unit’s gallon per minute (GPM). It will not hurt to purchase a gun that is rated at a higher GPM than your unit produces. 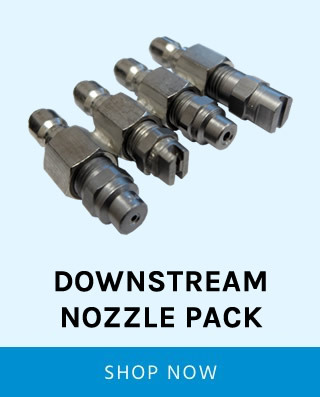 Typically, on a pressure washer gun, when using a downstream injector, it is recommended to use a higher GPM gun as they will cause less restriction and allow the down streamer to draw chemical more easily. What PSI rating do I need? As with GPM choose a gun that is rated at least the PSI rating of your unit. Just as with GPM and your gun: higher is always better. Using a higher rated gun can save money in the long run because it gives you more flexibility when you change equipment or if you have more than one unit. 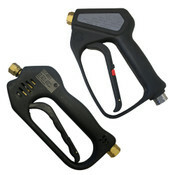 The Suttner brand guns are the most popular guns we stock. Suttner guns are both reliable and durable and, in the 18 plus years we have carried them, have had minimum warranty issues. The ST–1500, ST–2305 Easy Pull, ST-2605 and the ST–501 (a low-pressure gun) are the most popular guns we sell and for good reason. For a pressure washing gun the ST-1500 has been the industry standard for many years. It is an incredibly dependable gun with minimal frills but is very comfortable to use by large or small hands. 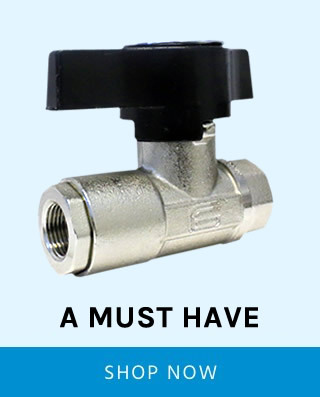 The Suttner ST-1500 gun has industry standard 3/8” mpt inlet and 1/4” outlet that suits the need of most contract cleaners. The St-2305 Easy Pull offers the same great features with the added benefit of being easier to pull throughout the full pull range of the trigger. The St-2305 also offers the same features of the St – 1500 but when fully engaged gives a relaxed trigger feel that is easier to hold in the engaged position. How long does a gun typically last? A pressure washer gun under typical commercial use will last anywhere from 3 months to a year. This of course depends on a couple of factors such as local environment and upkeep. In sandy areas, for example, trace amounts of sand may be in the water which can prematurely wear the ball and seal in a gun. Areas with hard water will have a similar effect. In addition, make sure you rinse the gun (just as would with any of your equipment) of any chemical residue or deposits which can reduce gun life. Lastly, having a gun rated to close to your unit’s GPM/PSI means you are operating the gun at, or near, it’s maximum range. 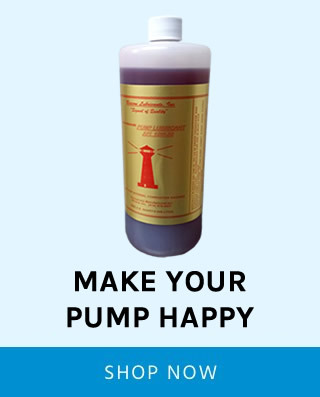 This will greatly reduce the life of your gun. Do you offer rebuild kits? 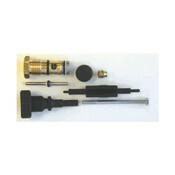 Yes, we offer rebuild kits for all the Suttner guns we sell. The kits are easily installed and on average take about 30 minutes to 1 hour to install. However, after figuring the cost of the kit and the labor component, most of the contractors we have spoken to find it more cost effective to just replace the gun instead of repairing it. That being said, having a repair kit for your gun in case of a problem on the job is never a bad idea.